Below is a letter, written by Eleanor McGhie, to her niece, Mary Mossop, in 1873. You can read an article pertaining to who Eleanor McGhie was and the period in which the letter was written. 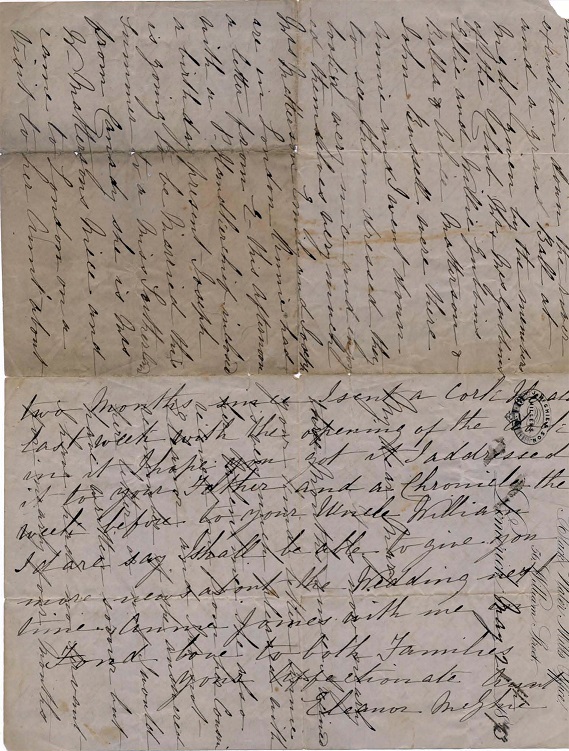 This is a very interesting letter as it is partially written horizontally and then vertically, this was common practice in the period to save paper. It is now nearly three months since I received your kind letter. Annie is very much pleased with her Valentine; she also received one from her cousin Eleanor and I do not remember if she answered her letter or not. I would have written sooner but I have had no servant for nearly four months so I am kept busy. I must now tell you some news of last week — the Lord Lieutenant of Ireland and his Lady paid a visit to Limerick to open the new graving dock. They were here two days; it caused great excitement and made a stir. They arrived at half past one o’clock on Tuesday at James Spaights Esq., Georges Street where they took luncheon. They opened the Dock at 3 o’clock and then went up to the Model School where they were received in the Boys School rooms by the children singing “God Save the Queen”, other songs were afterwards sung by the pupils which gave much satisfaction. They then went into the Infant School rooms where they were very much pleased with the recitation of the —- Pidgeon. They then proceeded to the Girls School room. They were all at their desks writing transcriptions. The Inspector took up two copies, Annie’s and another, and handed them to the Countess; she said they were very nicely written. One of the girls was then brought up to recite “Lady Clare”. It is one of Tenyson’s poems. They expressed themselves much pleased with the manner in which it was said. Every room in the school was beautifully decorated. the Viceregal party then went to the Convent School and other public institutions. On Wednesday there was an exhibition down the river and a grand ball at night, given by the members of the Club. Mr. & Mrs. Gubbins, Ellie and Willie Gubbins, Bella and Alice Matterson and John Russell were there. Annie and I went down to see them dressed; they looked very nice and enjoyed themselves very much. Mrs. Matterson, Emily and Joseph are in London. Annie had a letter from E- this afternoon with a P- handkerchief enclosed, a birthday present. Joseph is going to be married this summer to a Miss Sunderland from Canada; She is Mrs. W. Matterson’s niece and came to London on a visit to her aunt about two months since. I sent a Cork Herald last week with the opening of the dock in it, I hope you got it. I addressed it to your father and a Chronicle the week before to your Uncle William. I dare say I shall be able to give you more news about the wedding next time. Annie joins me in Fond Love to both families. 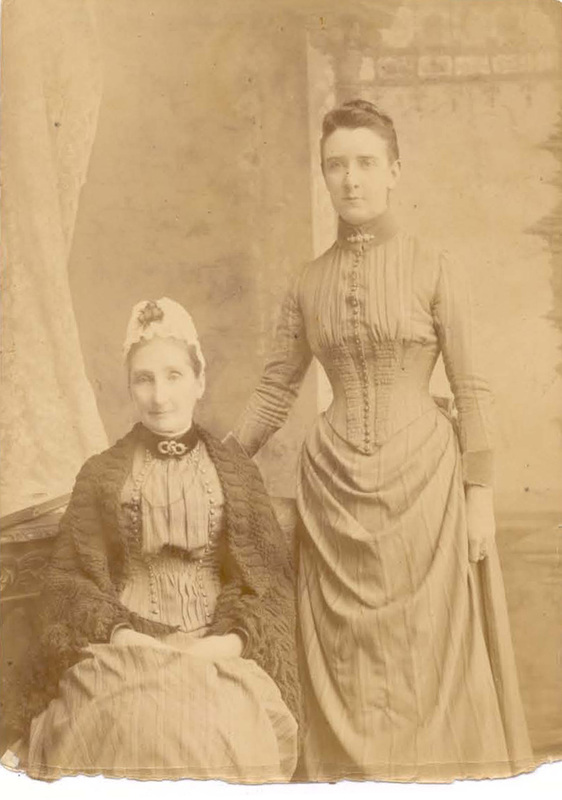 Eleanor is pictured below with her daughter, Ann McGhie.